For cost saving and outlet saving purposes, PLANET has launched the new Layer 2 Web Smart Switch with built-in PoE injector function, the FGSW-1828PS. Besides the switch architecture design, the FGSW-1828PS also complies with IEEE 802.3af Power over Ethernet standard and provides PoE power provision feature, meaning the FGSW-1828PS can provide PoE power to 8 IEEE 802.3af compliant devices. The FGSW-1828PS provides 16 10/100Mbps Fast Ethernet ports with 8 PoE interfaces, supports MDI / MDI-X convertible on 16-10/100Mbps ports and also provides PoE inject function on Port 1 to Port 8 which is able to drive 8 IEEE 802.3af compliant powered devices. The FGSW-1828PS also provide two Gigabit Ethernet ports, either TP or SFP per port. The two Gigabit ports can either be 1000Base-T for 10/100/1000Mbps or 1000Base-SX/LX through SFP (Small Factor Pluggable) interfaces. The distance can be extended from 100 meters (TP), 550 meters (Multi-mode fiber), and up to above 10/20/30/40/50/70/120 kilometers (Single-mode fiber). With its auto-negotiation capability, all the RJ-45 / STP ports of the FGSW-1828PS switch can be configured to speeds of 10/20Mbps / 100/200Mbps (Fast Ethernet) or1000/2000Mbps (Gigabit Ethernet) automatically. In addition, the product are equipped with the MDI/MDI-X auto detection for easy plug and play connection, regardless of cabling types — straight through or crossover. The FGSW-1828PS also provides a simple, cost-effective, and highly reliable network connection for data as well as power. Furthermore, it is the ideal device for bridging among Ethernet, Fast Ethernet workgroups and networks, and all kinds of the Ethernet installation, such as campus, workgroup, department, enterprise, telecom and industrial applications. The FGSW-1828PS is equipped with non-blocking 7.2Gbps backplane, greatly simplifies the tasks of upgrading your LAN for catering to increasing bandwidth demands. 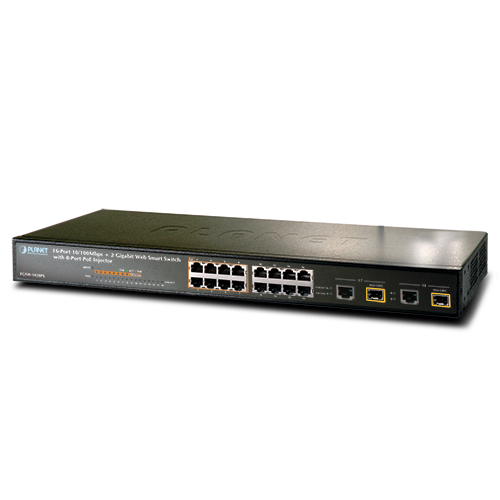 For efficient management, the FGSW-1828PS switch comes with remote Web interface and can be programmed for advanced switch management functions such as SNMP Alert Trap, port configuration, port-based / IEEE 802.1Q / MTU VLAN, port mirroring, port trunk, QoS, bandwidth control, broadcast storm control, MAC address / TCP & UDP filter and IGMP Snooping v1/v2. The PoE settings, such as PoE power Disable/Enable and PoE power consumption monitoring, are available. With its 7.2 Gigabits per second, non-blocking switch fabric, the FGSW-1828PS can easily provide a local, high bandwidth, Fast Ethernet network for backbone of users’ departments. With two SFP ports, the FGSW-1828PS provides the uplink to the backbone network through Gigabit Ethernet LX / SX SFP modules. Providing up to 8 PoE, in-line power interfaces, the FGSW-1828PS can easily build a power centrally-controlled IP phone system, IP camera system and AP group for the enterprise. For instance, 8 cameras / APs can be easily installed around the corner in the company for surveillance demands or build a wireless roaming environment in the office. Without the power-socket limitation, the switch makes the installation of cameras or WLAN AP easier and more efficient. 2014-12-26 2.0b140929 Release for hardware version 2.0 only.